Last night, Iowa Senator Joni Ernst put us all firmly to sleep with a gentle fairytale about our glorious new life in Tea Party America. Rep. Carlos Curbelo, a Florida Republican, was set to deliver an almost identical Spanish-language version of Ernst's speech (minus the stuff about being a humble farm girl). Curbelo's though, mentioned one thing Ernst didn't: immigration. Curbelo was originally set to deliver an exact translation of Ernst's speech, with nothing added of his own. Late in the day, though, that suddenly changed, as Mother Jones reports, with the House Republican Conference telling MJ that the speeches would "deliver the same Republican message." Earlier that day, a representative from Curbelo's office had confirmed to the magazine that the congressman wouldn't deliver his own remarks. As the Washington Post highlights here, even as the speeches changed, they stayed generally the same: both politicians stressed their humbelish beginnings, and said they would repeal Obamacare and fight ISIS. 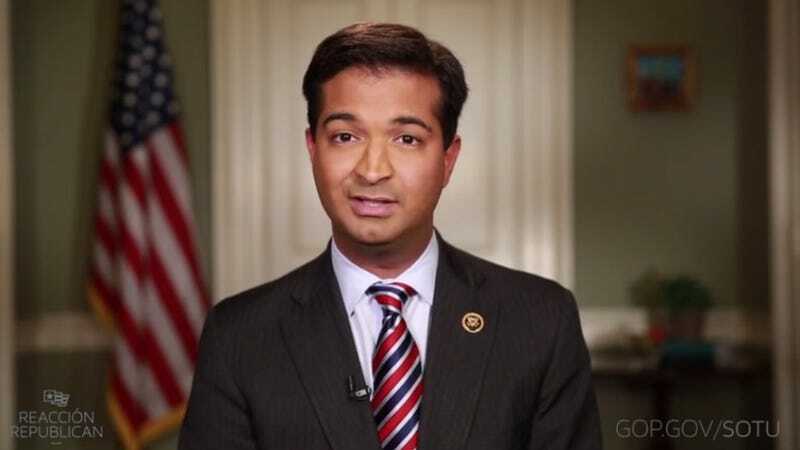 But Curbelo also added, "We should also work through the appropriate channels to create permanent solutions for our immigration system, secure our borders, modernize legal immigration and strengthen our economy." (Several reports on Curbelo's speech don't mention that he said "secure our borders," but he definitely said it, at 5:49 in the video below.) In a nod to Florida's anti-Castro voter base, he also pledged to fight "brutal dictatorships" including "Cuba and Iran." In truth, it would've been slightly awkward for Ernst to mention immigration reform, given that she's said repeatedly that she "doesn't support amnesty." And, as Mother Jones points out, because she's endorsed the idea of making English the official language of the United States, and in 2007, when she was a county auditor, joined a lawsuit that fought making voter forms available in languages other than English. Curbelo told the Washington Post he had no idea why Ernst didn't mention immigration: "Maybe immigration reform isn't important in Iowa. You'd have to ask her why."